John* was born on the day World War II began, Pearl Harbor Day in 1941, in the east Arkansas flat delta farmlands. He was a sharecropper’s son and went to very poorly funded “colored” schools in Keo, 20 miles south-east of Little Rock. He probably had dyslexia then, as he shows signs of it now. When he reads, he often still reads “no” instead of “on”, etc., but now he is conscious of his brain’s habit patterns and has learned how to read letters, as he sees them, moving from left to right. Back in the 1940s, dyslexia was not widely understood by most teachers, much less by teachers in some of Arkansas’ poorest schools. Thus John never learned to read well, as there were no instructors trained to help him with his reading disability. John has led a successful life. He was married for 35 years, and has 5 grown children and 15 grandchildren. His longest, happiest job was being a truck driver out of Detroit. He retired and he moved back to Arkansas from Michigan in May of 2011. After he retired, John decided that it was time to really learn how to read. He had heard about Literacy Action and came into our office in January of 2015. An active churchgoer, he wanted to learn to actually read his Bible. He was the first student I have ever tutored who wanted to learn cursive writing. John told me that his late wife had beautiful cursive handwriting and he knew it was something he wanted to learn. We found him a wonderful cursive chart with capitol and small letters, which not only had all the letters written in large cursive print but little arrows to show which way to move one’s pencil or pen to make each letter. John now writes in beautiful cursive. Every week he writes down, in cursive, the Bible verses for his Sunday school lesson and a set of questions about the lessons. He reads this out loud to me, and we both laugh when he has forgotten to dot an I or cross a T.
John has really enjoyed reading, in class, some of Literacy Action’s small non-fiction books. He also has read out loud to me all three of Congressman John Lewis’ graphic autobiography books about the civil rights struggle in the south, “March Volumes 1, 2, & 3“. 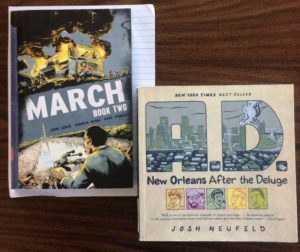 He is currently reading, in our sessions, a graphic history book, “New Orleans After The Deluge,” which contains true stories about several people and families surviving Hurricane Katrina in 2005. John and I are happy and enthusiastic about meeting twice a week to read and write together. *Many of our students have lived long, successful lives without knowing how to read. They develop coping mechanisms to hide their illiteracy, so family and friends won’t discover “the truth.” The student in this story wasn’t comfortable sharing his name, but wanted to share his story to help inspire other new #ARreaders who are just starting their learning journey.